Welcome to the COOLA Organic Skincare Giveaway! Have a fresh face this summer with this fantastic skincare line of products. The Clam Glow Eye Gel soothes delicate skin with a protective barrier that reduces redness and inflammation while shielding skin from damaging irritants. The Fresh Relief Face Serum is a lightweight serum is your stealthy defense against aging. And the Clear Recovery Foam Wash is a protective foaming face wash that will cool and tone skin, reduce inflammation and minimize the appearance of age spots. Make sure you check The Review Wire’s full review on COOLA: Environmental Repair Plus Line. 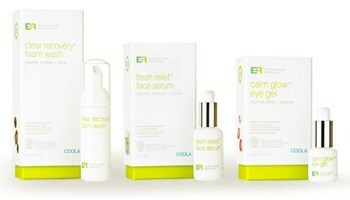 Two winners will each receive the COOLA ER+ Line (ARV $146) that includes: Clear Recovery Foam Wash ($24), Fresh Relief Face Serum ($68) and Calm Glow Eye Gel ($56). See form for Entry Details. Open to U.S. You must be 18 years old to enter to win. Ends 4.23.13. Disclaimer: The winner will be chosen randomly through Giveaway Tools and contacted via email. A reply to the winning email is required within 48 hours before a new winner is chosen. One person entering per household please. U.S. only. This giveaway ends at 11:59 PM EST on April 29, 2013. This event is sponsored by COOLA and hosted by The Review Wire. Simply Stacie was not compensated for this post and is not responsible for prize fulfillment. Companies and bloggers, if you would like to participate in group giveaway events like this one, sign up to be emailed about future events hosted by The Review Wire. I would love to try the Plumeria moisturizer.